4 Bedroom Detached House For Sale in Lightwater for Asking Price £799,950. An incredibly spacious and unique four bedroom family home situated within a quiet cul de sac of just three houses. Available to the market for the first time since constructed in 1963 having been occupied by the existing owner who has lived in the property for over 55 years. Internally the property is a superb size throughout and internal viewings are highly recommended to be able to fully appreciate this wonderful home. 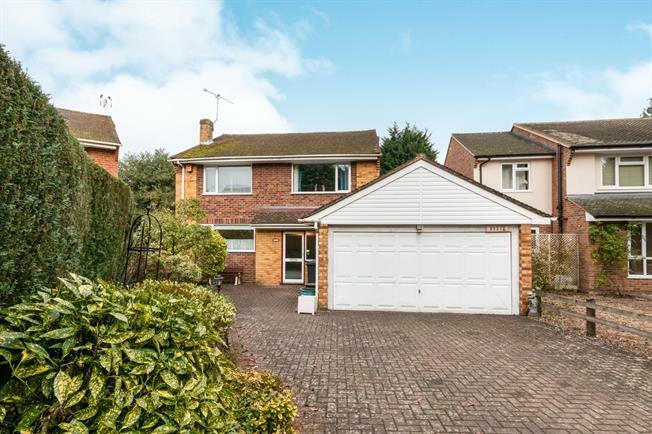 Internal accommodation comprises a large porch with built in cupboards which leads to a spacious entrance hall on to a large kitchen diner, utility room, stunning dining room, downstairs WC, integral access to a double width garage and a study area. One of the many selling benefits to the property is the entertaining space the ground floor offers with an open plan L shape lounge diner with a step down to the family area which leads on to the conservatory which overlooks the garden. Upstairs offers four excellent size bedrooms and a family bathroom. The master bedroom is a particular feature with built in wardrobes, dressing area and a four piece en suite shower room. The front of the property offers ample parking leading to the garage. The rear garden is a generous size and very secluded.